So how does this yarn work up? The short answer is, really nicely with some shedding. However, it hasn’t shed since I’ve worn it. From what I saw, the friction from the movement of crocheting and hooking the yarn was causing it to shed. Once wearing the vest, it hasn’t seemed to shed at all. You also want to avoid frogging it and that’s why I’ve made this pattern as absolutely simple as possible so you won’t need to frog! Is it difficult to see the stitches? Yes, it’s hard to see your stitches, but by using a large hook and simple stitches, I had no trouble at all. As I worked across the row there were times that I would feel the fabric to find my stitches. Once I got going though, it was easy to get in the groove and crochet as normal across each row. If you can’t see your stitches, use your fingers and feel for the next stitch in order to work through it. 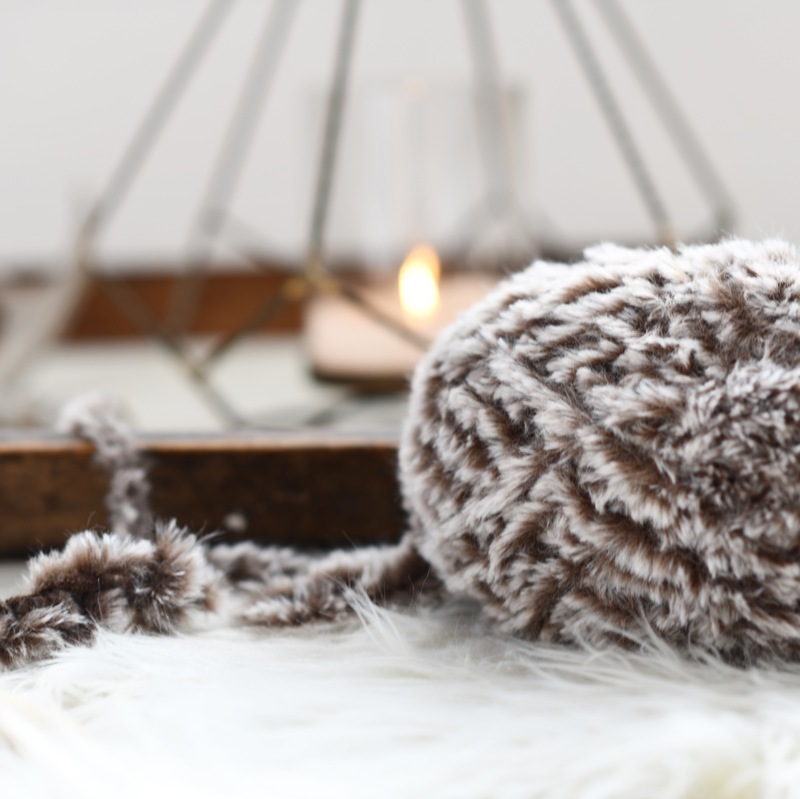 I hope that you enjoy this project and I’m thrilled that it’s the second in my Hygge Winter Collection. 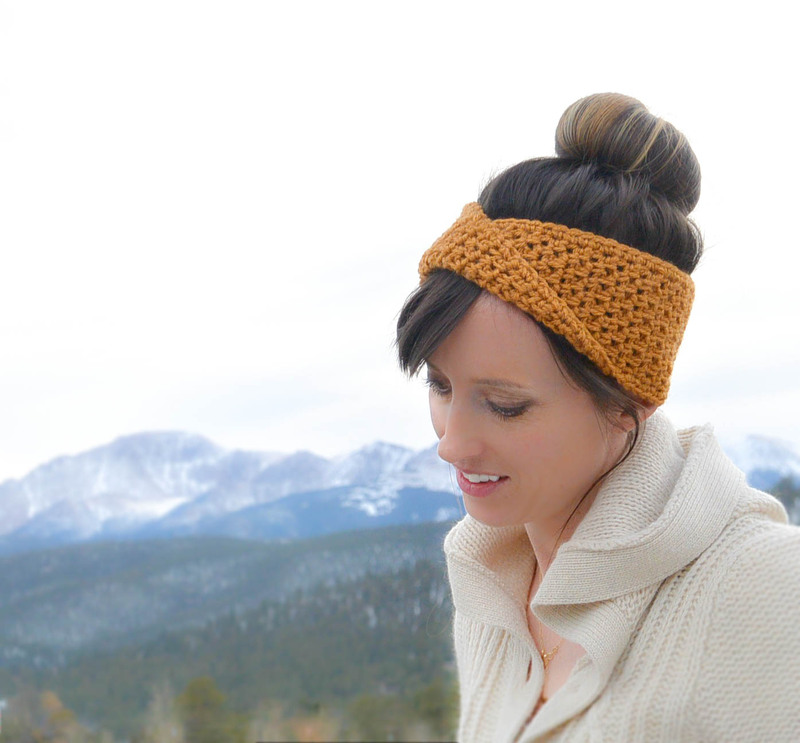 Sign up for my newsletter to follow along if you want to see all of my newest winter patterns! 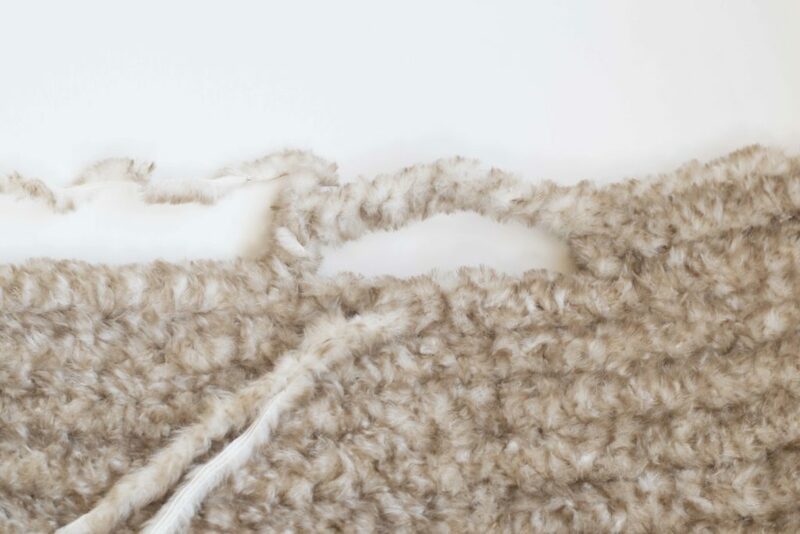 And scroll down for the free pattern and some photos to help you along 😉 You’ll see that it’s essentially a rectangle with shaping for the arm openings – keeping it simple so you can easily make this furry goodness! 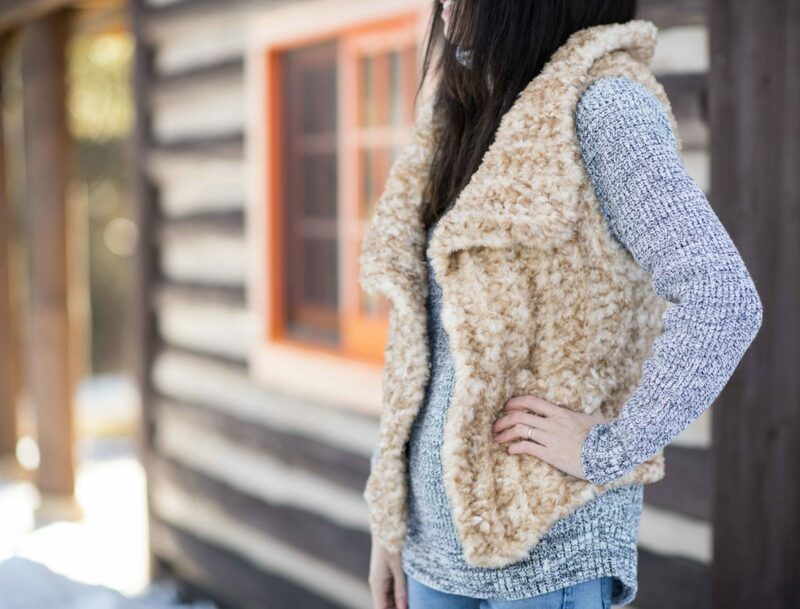 Pattern Description: This incredibly soft faux fur vest makes a cozy and fashionable accessory for any winter outfit. 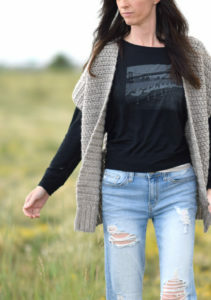 Wear it with your sweater dress or pair it with jeans and a flannel top for an ultra-casual, comfortable look. 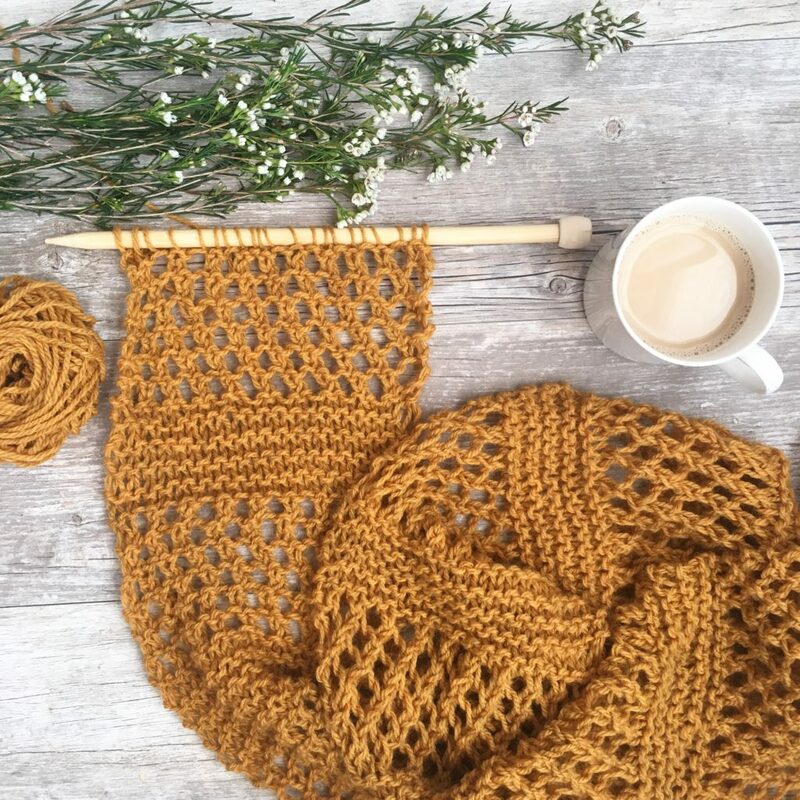 You’ll find that it’s made with basic crochet stitches and includes minimal shaping so it’s great for beginners and experienced crochet artists alike. 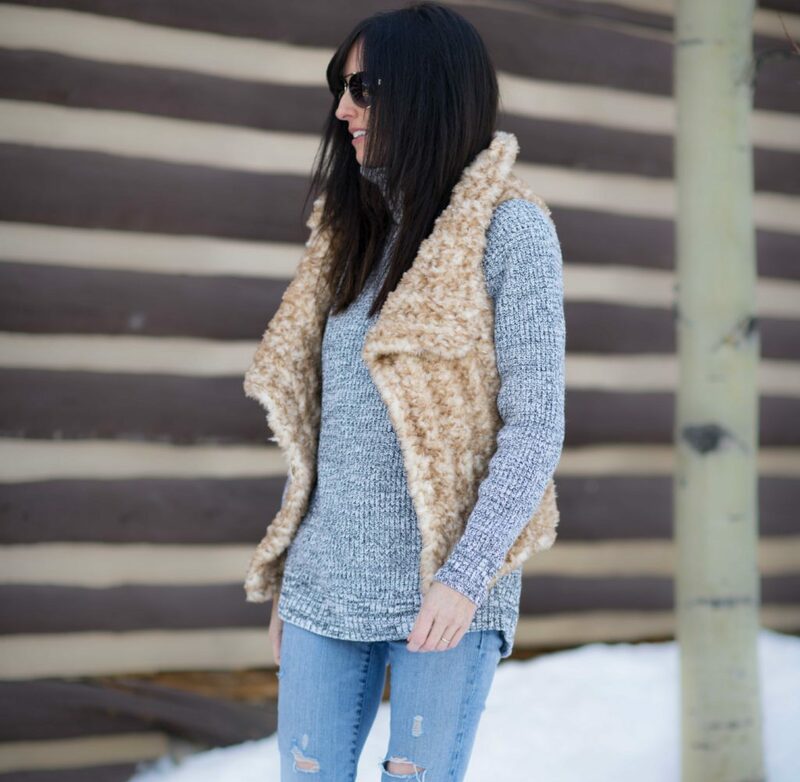 Beautiful ribbed stitching on the collar shows off the hues in the fur and the fit is sure to flatter. It’s important that your gauge matches the gauge indicated in the pattern for the size to turn out correctly. Adjust your tension or change hooks accordingly to obtain correct gauge. 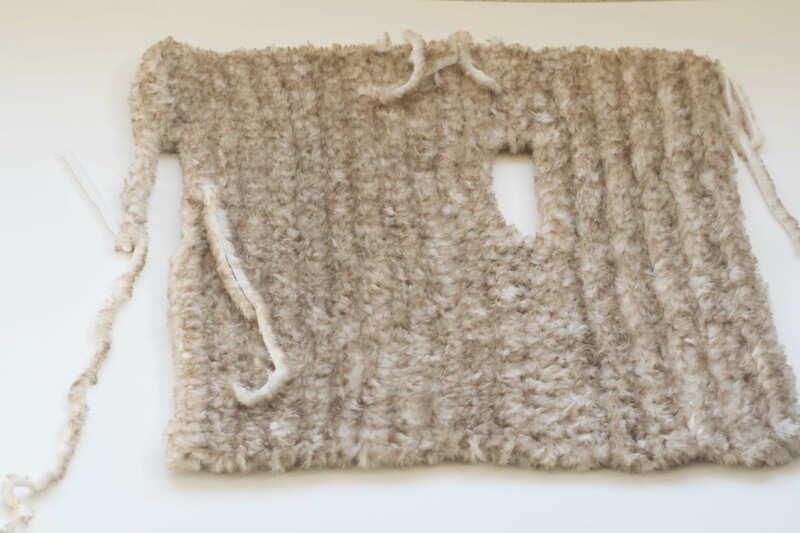 Notes: This vest is worked from one side to the other side with shaping for the arm openings. 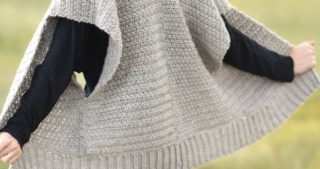 (See diagram and photos for additional assistance) The pattern is written in sections starting with the first collar, moving onto the arm opening, center back, final arm opening and second collar. 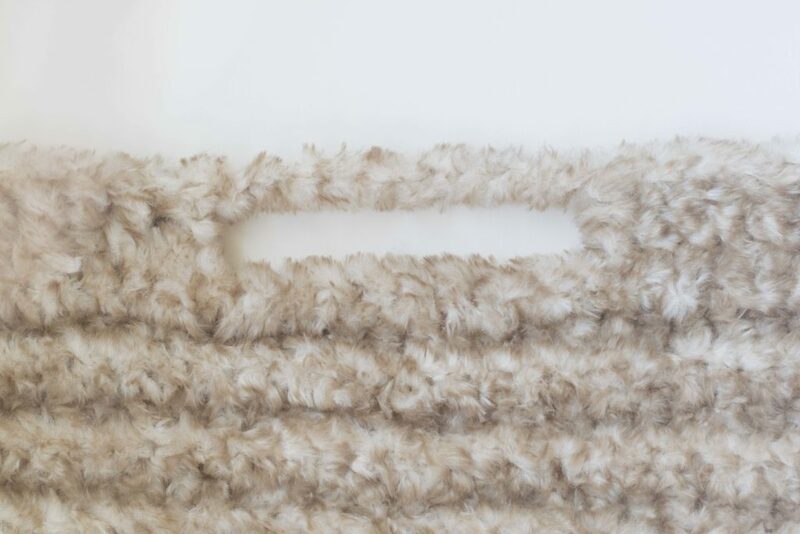 If you don’t clearly see the stitches due to the nature of the fur yarn, it may be helpful to feel for them within the fabric as you work across the rows. Tie off and weave in ends. Below: Make a chain as indicated in pattern, skip stitches and treble crochet to attach. 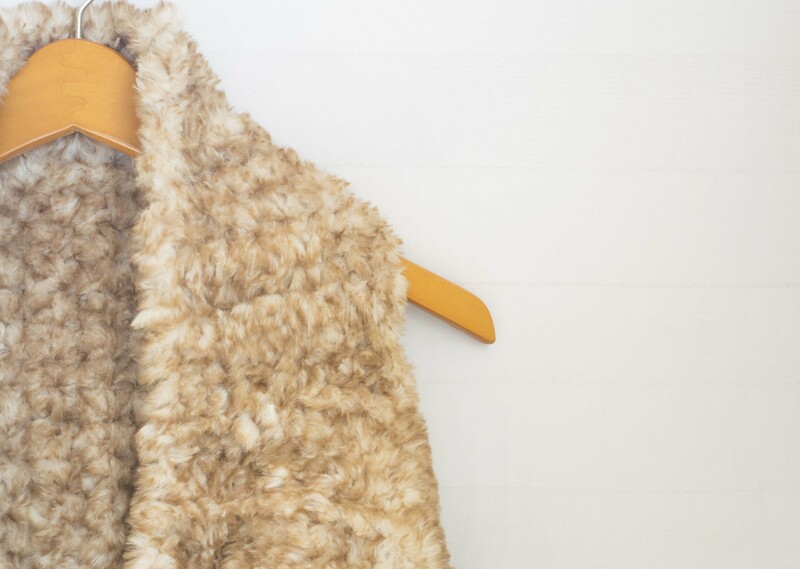 Enjoy your new, furry vest! 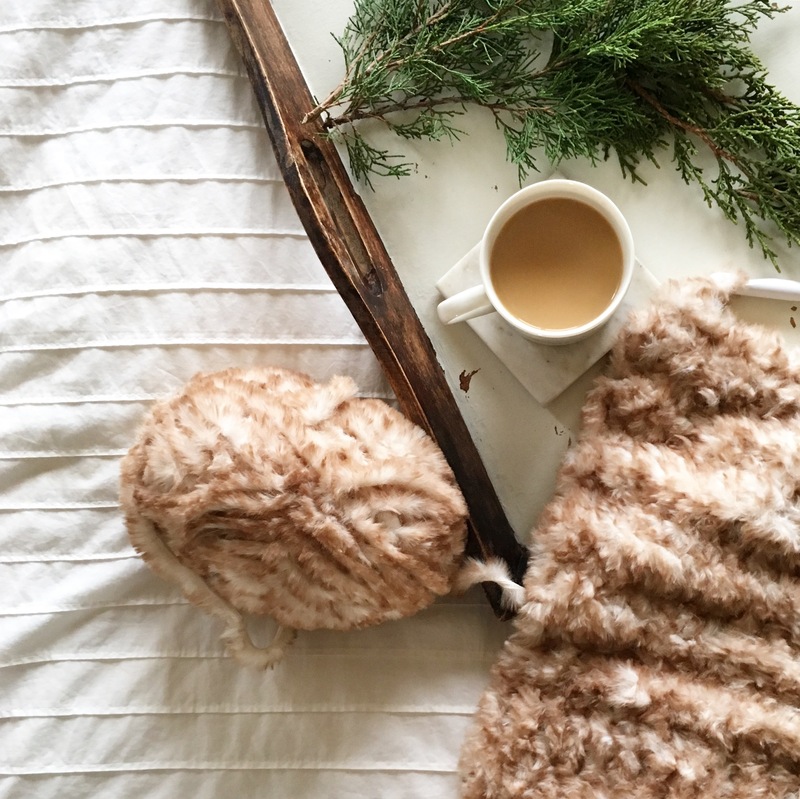 It was awesome to read some of your ideas on what you’d make with this fur yarn on Instagram and Facebook! 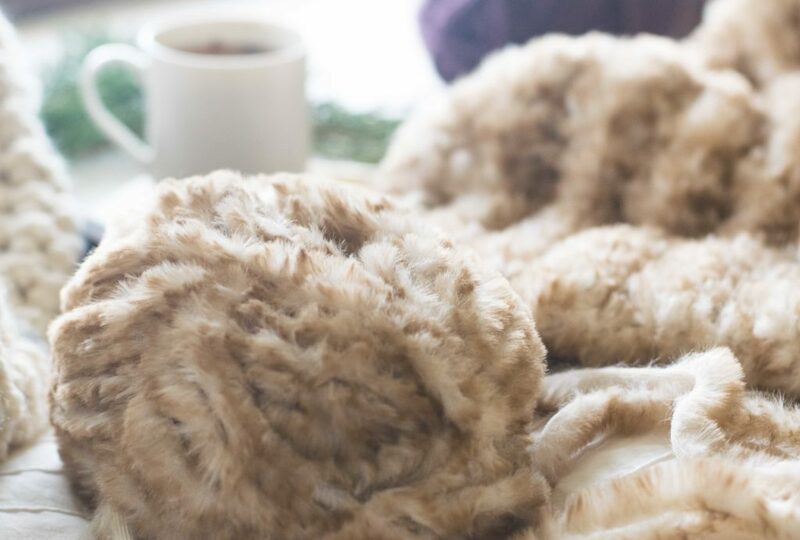 Feel free to share your ideas in the comments section here as well so we can dream up other things to make with this luscious faux fur. Thank you to Lion Brand Yarn for sponsoring this post. All opinions are 100% my own. Jessica, that is absolutely beautiful!!! 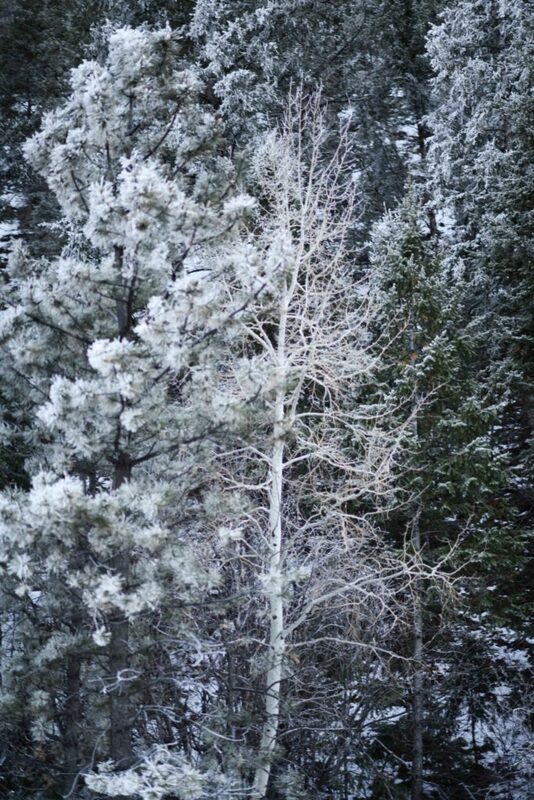 This is so perfect for the winters out here in the West!!! Was 18 when I left for work this morning… this would have been perfect for today!!! Gotta go get me some new yarn now!!! Thank you for such a great pattern!!!!!!!!!!! I love this! I will be working this in in Chinchilla! Jessica!!! I love this so much! Can’t wait to make it. What size are you wearing, if you don’t mind me asking? Im trying to decide between the xs or small. 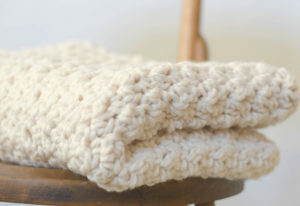 The yarn makes me nervous but the pattern seems simple and the style is adorable so it will be worth it!! Thanks for the great patterns! Jessica . . . . . you read my mind. I spent all afternoon yesterday searching for faux fur vest patterns. Just one thing . . . I can’t crochet. Any chance you’ll be adding more knitting patterns this winter. P.S. 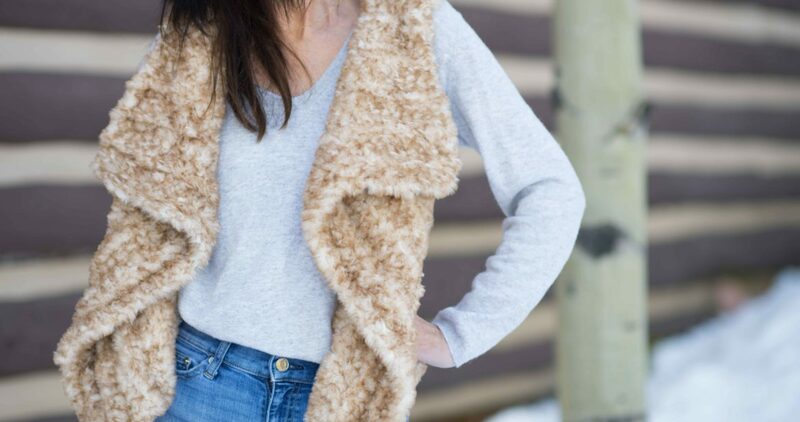 the vest is stunning on you! Lovely! the wheels are turning again! Jessica, this is gorgeous. Can’t wait to make one. Love the name of the yarn – Pomeranian, ha! Looks like one. Question – if I order the kit with the yarn will the pattern instructions be the same as listed here or more detailed? Love this so much!! I just don’t know how you continue to come up with such fabulous items. You are truly inspired! I’m going to definitely be making this and think I’ll make it a little longer to keep my backside warm! Thanks for ANOTHER fabulous piece! So glad you like it Judy!! Please make a knitting pattern! Thanks for the suggestion Jenn! You can look up Knitatude as she has a knit version! Love this! I have a friend who is so hard to pick out gifts for and I think she would love this! Wears vests all the time. Thank you for continuing to share such beautiful patterns! This is beautiful, but like many others I dont crochet . I do knit though so if you ever decide to convert this to a knitting pattern I would be very grateful. 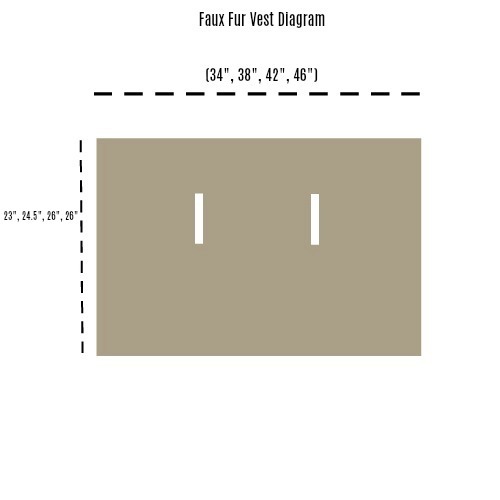 Can I please just print the pattern for the faux vest without printing so many pages? Hi Susan! You can copy and paste the pattern into Word and print from there. That’s the easiest! Or you can always purchase the printable version (without all the ads and extras) from my etsy shop. I crocheted the medium and when I got to the second armhole there was no way that it could fit across my back. I took it out and am trying again with the larger size but I even counted it and it was correct. Any thoughts on what I could have done wrong? Oh no! Can you measure how wide it is from one arm hole to the next? 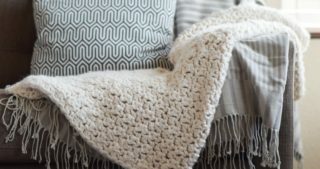 You certainly need to simply crochet for more rows through the middle. Does your gauge match mine, and are you using the correct hook? This can also make a huge difference. I also had this same problem while trying to make the XS, I ended up adding an additional 7 rows after the suggest 11 and it still didn’t fit. (my bust is also 32″ so it definitely should’ve worked with the XS) My gauge and hook were the same as yours but the pattern is very simple and easy so I will just take it out and continue to add rows until it works! I was so excited to find this pattern! I had been thinking I would love to make a furry vest; the hard part is out of the way for me with your free pattern. Thank you! Yes! Please make a knitting pattern! Knitatude’s is not the same style. I’m having some trouble with the armholes: I start with 38 stitches (size XL), but when I begin row 1 with the sc into the 2nd stitch from the hook I keep finishing row 3 of the arm opening with 37 stitches. I have no idea how I’m supposed to end up with 38 stitches. Please help! Blo…I’m having a hard time finding the blo. Is there a reason not single crocheting the regular way? The yarn is so furry, I can’t see the stitches…I have to feel for them. Hi I posted a comment yesterday. No need to post it. I’m just frustrated trying to find the BLO. Most of my frustration has to do with the fact that I have a wrist that is unable to bend or move back and forth. I’ll try again and if I need to I’ll just to a regular sc. Hi, I'm Jessica! Mama, Colorado gal, lover of yarn and life. 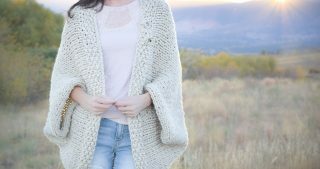 I like sharing my easy & timeless knit and crochet projects and patterns. 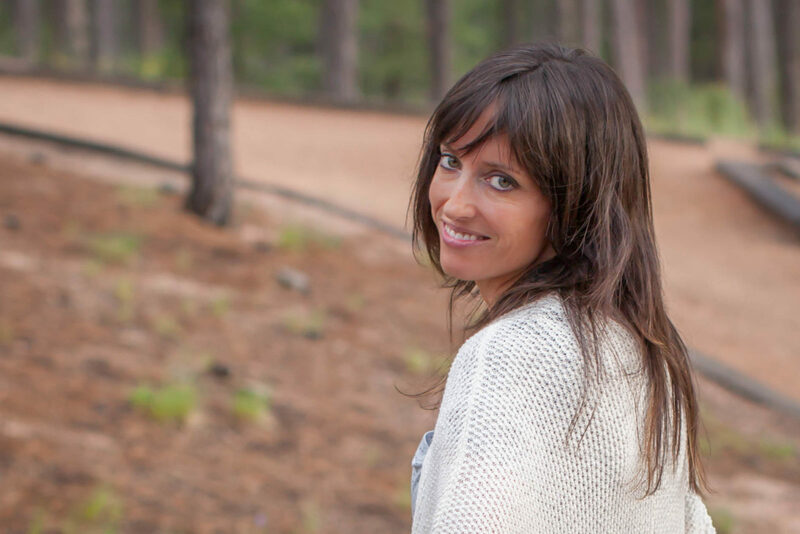 You'll also find some DIY's, random thoughts and a bit of nature - Come on in! Don’t miss a pattern! Sign up for Mama’s free newsletter. All material Copyright Mama In A Stitch unless otherwise noted. Please do not reprint, publish or post my material. Please don’t use my photography if you use my patterns to make and sell finished product. You may have a description of my post and one picture while linking back to my site. Thank you! This blog/website displays third party ads. All patterns are created with an attempt to be as accurate as possible but are made and tested by humans and therefore may contain errors.